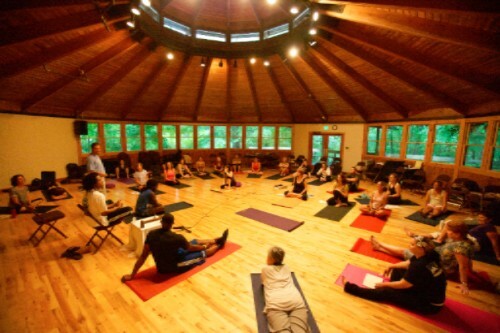 The Holistic Life Foundation has hosted its Youth and Yoga Mindfulness Training for the past 5 years at the beautiful Omega Institute in Rhinebeck, NY. In this week-long program, the founders of the Holistic Life Foundation—Ali Smith, Atman Smith, and Andres Gonzalez—show attendees how to teach yoga and mindfulness to today’s youth, gain a deeper understanding of the needs of today’s youth in diverse environments, and learn new yoga and mindfulness skills to help fulfill those needs. Through a combination of practice, lectures, panel discussions, and exercises, participants learn asanas, pranayama, centering exercises, mindfulness practices, andmeditations. We also explore techniques for developing youth engagement principles, teaching philosophies, and strategies for working with “problem” students, while also exploring methods to make the whole approach practical and, most of all, fun. This is an exceptional opportunity for any skill level in yoga and mindfulness and those who are interested in teaching these techniques to today’s youth, including teachers, yoga instructors, and helping professionals who wish to use the techniques in their practices.